A man who bragged about his 'cushty' life in prison has been jailed again after causing £8,000 damage when he rammed into the front of a sports car. Banned driver Patrick Bradley, 26, rammed the Mercedes sports car after chasing the owner from a tanning shop. 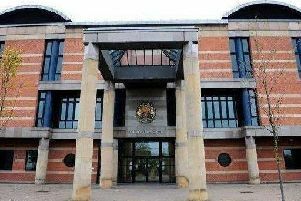 He caused £8,000 damage to the £17,500 car after threatening the driver with a 4ft wooden pole. Bradley and four other men confronted Connor Flanagan at teatime on March 26 outside the Suntrap salon in Catcote Road, Hartlepool. Prosecutor Philip Morley told Teesside Crown Court that Bradley shouted to the others "Get him out of the car". Mr Flanagan told police later that he was sure that the men planned to steal the black Mercedes. He managed to drive away but Bradley jumped into a red VW Golf and started to pursue him, and the other men got into a Pajero vehicle parked nearby. Mr Flanagan turned into a car park at a playing field but the Golf parked across the exit and Bradley got into the Pajero and he drove it directly at the Mercedes causing extensive damage to the front of the vehicle. Mr Flanagan managed to drive away again, followed by Bradley in the Pajero, but Bradley gave up the pursuit at some traffic lights. Mr Morely said that Mr Flanagan recognised Bradley and he was able to name him to police. Bradley gave a "no comment" in his interview . Bradley had 19 convictions for 30 offences on his record, including possession of a stun gun and dangerous driving. Stephen Constantine, defending, said that Bradley became involved after there had been an exchange between his cousin and Mr Flanagan, and he regretted the damage to the Mercedes. The court heard that five days before his arrest his partner gave birth to their son. He was re-called to prison until January next year, and he had completed courses on Victim Awareness and Violence Reduction. Bradley pleaded guilty to affray, possession of an offensive weapon, two offences of dangerous driving, criminal damage, driving while disqualified and without insurance. Judge Peter Armstrong said that Bradley's previous convictions for similar offences had aggravated the situation. Bradley, of Wynyard Mews, Hartlepool, who appeared over a videolink from HMP Northumberland , was jailed for 12 months and disqualified from driving for 18 months and until he passes an extended driving test. Bradley appeared in the national media in 2015 after being locked up for threatening to firebomb a woman’s home. He also threatened to drive a Jeep through the front window of a woman’s house. He was jailed for almost four years for the crime, but from behind bars he took to social media to talk about how great life is inside. In comments made on Twitter he talked about his cushty’ life and posed for pictures with another criminal.